Jordan Owens' late header left it level at half-time as Crusaders bounced back to beat Warrenpoint Town. Pic by Pacemaker. The greatest lesson Warrenpoint Town may yet learn from the injury-time heartache of Saturday’s last-gasp defeat to Crusaders could come from the very character on show by the visitors that helped deliver the final blow. Philip Lowry’s injury-time header secured success for defending champions Crusaders - minutes after a penalty save by Sean O’Neill to prevent Marc Griffin handing Warrenpoint Town a late lead. The winning goal arrived as two Crues substitutes combined to turn the tables on a day of drama, with Lowry’s goal off a Ross Clarke corner-kick with the clock on 92 minutes. It was the second Crusaders goal of the afternoon in injury-time as Stephen Baxter’s men earlier got back on level terms in the closing seconds of the first half thanks to Jordan Owens. Warrenpoint were handed a golden opportunity to gain a first win of the season - and cap a superb performance - when Michael Ruddy’s foul on Simon Kelly resulted in a penalty kick. However, Griffin could not find a path past O’Neill. 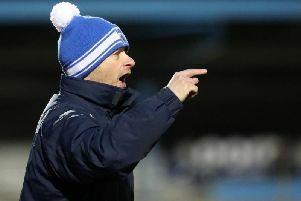 Setting aside the natural post-match pain, Warrenpoint manager Stephen McDonnell can draw comfort from the progress of his basement-based players to push Crusaders to the final seconds, plus draw inspiration from the self-belief honed within the champions’ camp over hours together in training and shared moments like Saturday. Crusaders’ identity has been crafted thanks to trust, time and patience - all aspects of the work McDonnell is determined to utilise as he continues along the grassroots stages of developing his squad’s character. “It is devastating not to come away with the minimum of a point but we know what quality we have and understand it’s a process,” said McDonnell. “Come gameweek 38 we know we will be fine, we firmly believe in what we are doing and displays like today give us that faith. “We have quality over the pitch and you could see that going toe-to-toe with the champions. “A lot of teams play direct football, we want the platform to play the brand of football we want and Simon Kelly and Maxim Kouogun gave us that opportunity to play attacking football but also think about Crusaders. “I’m not disheartened, it’s a gradual improvement week-on-week but we can see how it’s improving. The contrast between a convoluted away free-kick move early on which resulted in Crusaders confusion compared to the clarity of two set-piece goals to seal victory serves as a fine snapshot of what makes Stephen Baxter’s side such a model of efficiency and consistency. “I always felt we had that momentum to get that second goal but Warrenpoint were lively on the break with willing runners so we had to be on our toes the whole game,” said Baxter. “We chopped and changed looking for a way to win the game. “The match turns on a penalty decision with minutes to go, which was never a penalty, but to show the character and mentality to then go up and get a winning goal is great to see. “Warrenpoint have so much more going for them than I’ve ever seen, it’s as a good a Warrenpoint performance in all of my years coming down here. “We just had that bit of quality to unlock the door. “We got David Cushley on and he made a difference but that’s the squad’s character.